Online shopping has become a trend these days. It is now comfortable to do Grocery shopping directly from your Android or IOS mobile and get your products delivered to your home place without any charges. Today we discuss about BigBasket Grocery Shopping App and how really useful it is for you. BigBasket is very popular these days online with Ads from SharukhKhan. I never believed in heavy Ads, but after reading the BigBasket App review, I thought of giving it a try. My first order saved me Rs.700 and you would be wondering how. Let me share the details with you and what are the steps to be followed to get some best deals for you as well. Joining BigBasket family is very easy. You can join through this BigBasket Link or join through this BigBasket Referral Link which give you Rs.100 and me Rs.100 if you purchase Rs.500 or more on your first order. This is other than the discounts you get. 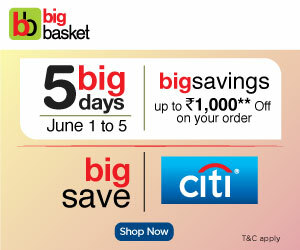 Bigbasket has huge deals when you do shopping on first week of every month. They have tieup’s with major banks such as CitiBank, ICICI, HDFC and wallets like Paytm. Other than the above, Bigbasket deals are also achieved through BigBasket coupon codes like BBVISA20 which gives 20% off instantly when ordered through any VISA card. I purchased two Lalita Brand Rice bags which are costing Rs.1550 each in the market. First it was available at Rs.1330 in BigBasket. Over that I got 5% cashback and 20% off as I hold CitiBank Card. So overall Rs.700 profit as I purchased through BigBasket. On top of it, I got Rs.100 cash back and my friend who referred me also got Rs.100 cashback. Not only this, there were many products which were having huge discounts. Do give BigBasket Deals a try and Do share your BigBasket Grocery Shopping App Review just as I did.